Buncefield is an oil storage depot in Hertfordshire, England. In December 2005 an explosion occurred in one bund that led to a catastrophic fire. Contaminated firefighting water and tank contents leaked into the ground despite the site being bunded. This blog briefly discusses why this happened and what can be done to prevent it happening again. Of the bunds that failed (which was most of them), the main failures were at the joints and at pipe penetrations. There will be joints in the walls and floors of bunds. This will be due to the practicalities of pouring concrete and also to control the expansion and contraction of the concrete. Best practice is to place a flexible waterstop across the middle of the joint. 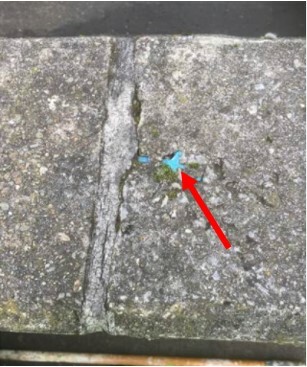 Sealant is then applied to the gap either side of the waterstop to keep stones and other debris out. 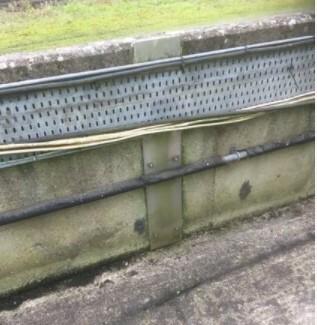 One of bunds at Buncefield had metal waterstops in wall and floor joints, this bund performed well. Other bunds with plastic waterstops and metal cover plates over the joints (see photograph) also performed well. Three bunds performed particularly badly. These had no waterstops and just replied on sealant in the joints. The sealant was not fire-proof and allowed the release of oil and firefighting water through the joint. 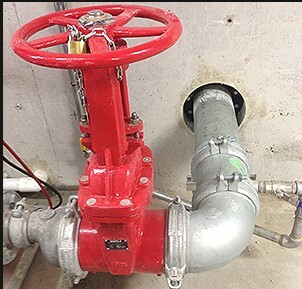 The lessons for building new bunds for flammable inventory are clear, either use metal waterstops or plastic waterstops with metal cover plates. Existing bunds with plastic waterstops or no waterstop can be upgraded with metal cover plates over the joint and fire resistant sealant. When assessing the integrity of existing bunds the presence of waterstops should be established. Plastic waterstops are the most common and are usually blue. Looking down on the bund wall it is often possible to see the end of the waterstop. If the presence of waterstops cannot be established, best practice is to upgrade the joint with fire resistant sealant and metal cover plates. If plastic waterstops have been fitted then the presence of cover plates on the inside of the bund wall should be checked. At Buncefield, there were a large number of failures at pipe penetrations. Hydrostatic testing of bunds will show whether there are leaks at the pipe penetrations, but will not assess how the penetration will perform in a fire. Where there is a need for pipe penetrations, best practice is to use a puddle joint during construction. 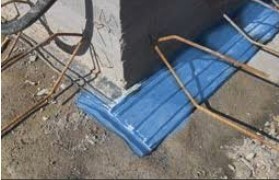 For existing bunds, installing a puddle joint is difficult and a number of alternatives exist. The most common option is to sleeve the pipe. This is done by locally reducing the diameter of the pipe where it passes through the wall and use the existing pipe as a sleeve. This article is a shorted version of the article published in the December 2017 issue of Sustainability Ireland, for the full version of the article click here. The author, Bob Sutcliffe, is a Chartered Engineer and Director of Environmental Efficiency. The material in this articles draws from his own experience of bund inspections throughout the UK and Ireland. Additional material has been taken from the HSE investigation into the fire at Buncefield. The author welcomes comments on this article.